By James Claiborn, Ph.D. and Cherry Pedrick, R.N. 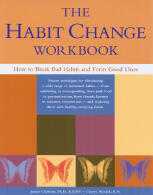 The Habit Change Workbook was published in 2001 by New Harbinger Publications. Wed like to tell you more about this valuable resource book. Below is an overview of The Habit Change Workbook. Are your negative habits taking over your life? Have you tried and failed, again and again, to lose weight? Do you struggle with nail biting or skin picking, or perhaps hair pulling (trichotillomania)? Are poor sleep habits interfering with your sleep? Is gambling ruling your life? Are such habits as tardiness, procrastination, or dishonesty interfering with your relationships? Do you spend hours surfing the Internet, watching TV, playing video games, or shopping? If these habits cause problems in your life, this book is for you! We will provide you with the skills necessary for making lifetime habit changes. The Habit Change Workbook is divided into four parts. Part I will help you understand how habits are formed and it will help you begin assessment of the habits in your life. Part II is the core of the book. We will give you step-by-step instructions to guide you through the Habit Change Program. Throughout the book, but especially in these chapters, you will be asked to answer questions and complete charts. Each step builds on the previous step. Information gathered in the first chapters will be used in subsequent chapters, so be prepared to put pen or pencil to paper and work the program, from start to finish. Escaping bothersome habits will be your reward. Part III provides detailed instructions for eliminating specific habits. You will learn powerful strategies for dealing with a wide range of troublesome habits. We also show you how to develop more rewarding and productive habits. Part IV will help you reach out to others as you struggle with habit changing. Family and friends can play important roles in the process of change. A support group may help you get rid of harmful habits by providing education and helping you feel less alone in your struggle. Finally, we introduce you to resources that can assist you as you work to change your habit.